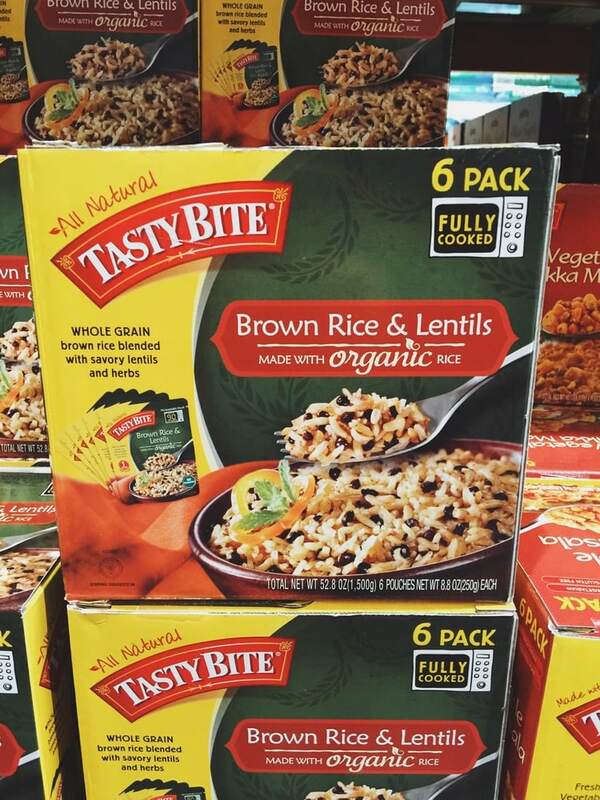 My top 21 Best Buys at Costco for all things FOOD! From tasty frozen finds, to fresh produce – Costco has it all. 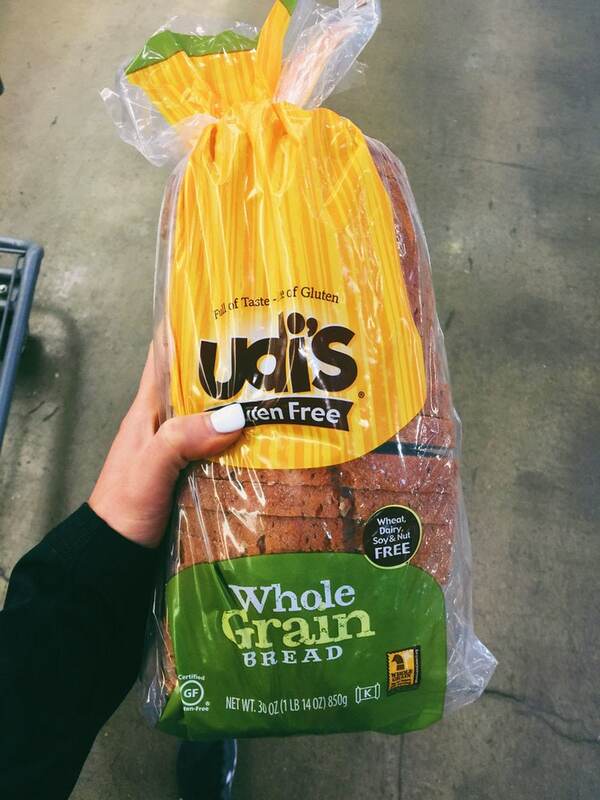 Get your grocery list ready for your next trip to our favorite wholesale store! Hey foodies, are you looking for the best buys at Costco? I have just the thing you’re looking for. 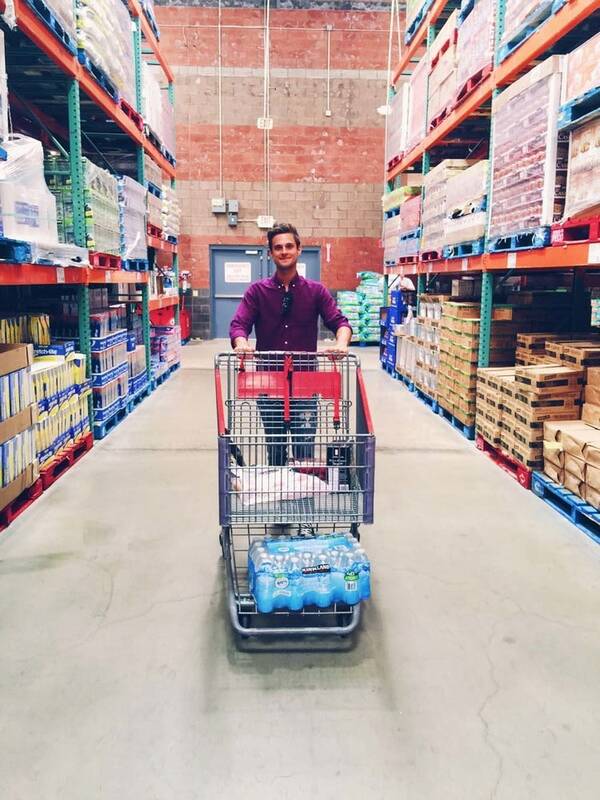 We know many of you love Costco, because well… Who doesn’t?! 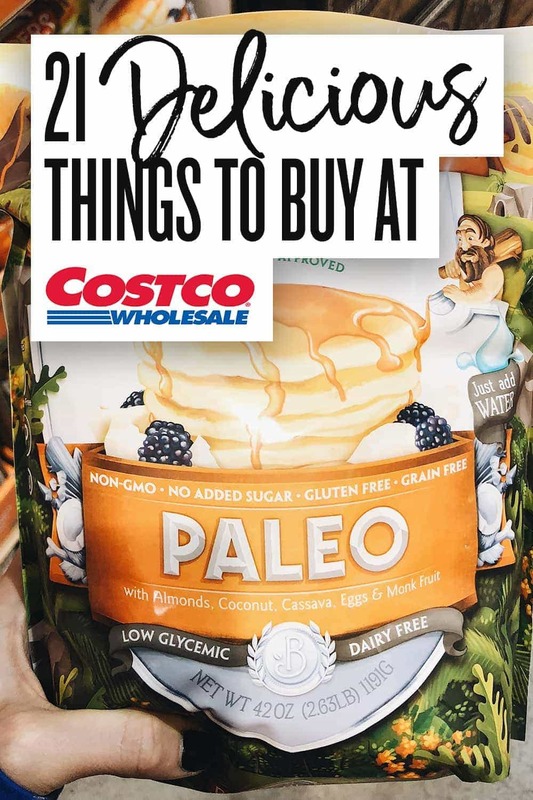 But since Costco is such a huge place, I wanted to share my top 21 delicious foodie finds to help you out on your next trip there. Shall we? This post is not sponsored by Costco, we are just love us a good Costco trip. 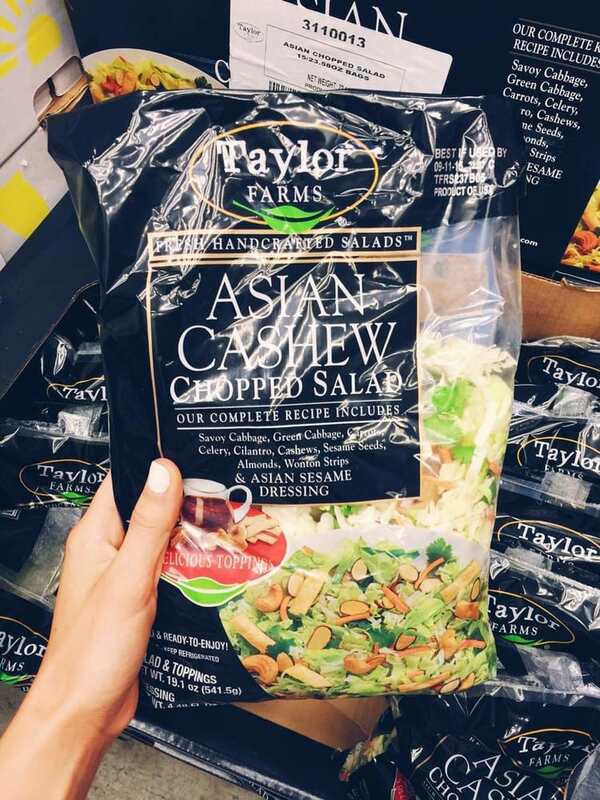 Costco has 3 bagged salads – all 3 are amazing, flavorful, and totally not boring. They also make your life a whole heck of a lot easier! Salad in a bag, heyoo – my kinda thing. This Asian salad is definitely a must try! This chopped salad comes with a sweet poppy-seed dressing and a delicious texture topping with pumpkin seeds and cranberries! I guess you could say this was our “first love” salad from Costco. We usually swap back and forth between this and that nommy Asian salad! 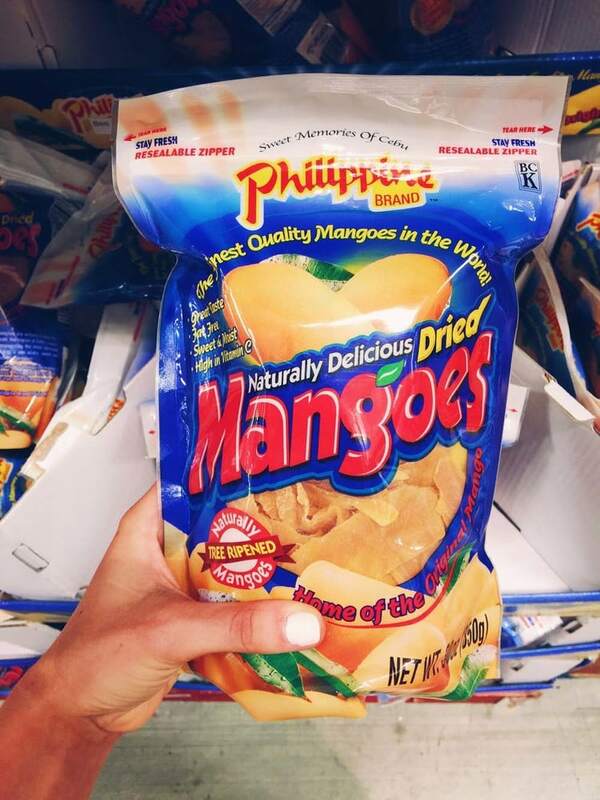 If ever i’m in need of a little treat, I love getting these dried mango’s! I used to be overly obsessed with them, but I’ve toned it down a bit and gained a little self control. 😉 If you like dried mangos, you will for suuure find these delicious! 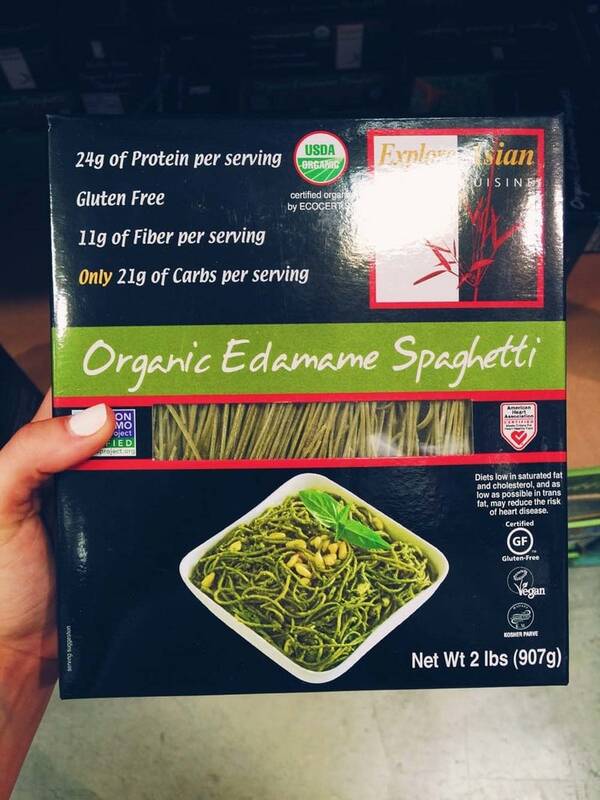 Such a good pasta find – completely plant-based and packed with protein. We eat this with pasta sauce and sometimes turkey meatballs! It’s obviously healthier, but gives you a satisfying feel of pasta without the guilt. It takes only several minutes to boil, and one box alone will last you forever. I find myself frequently falling in love with the freezer section at Costco. 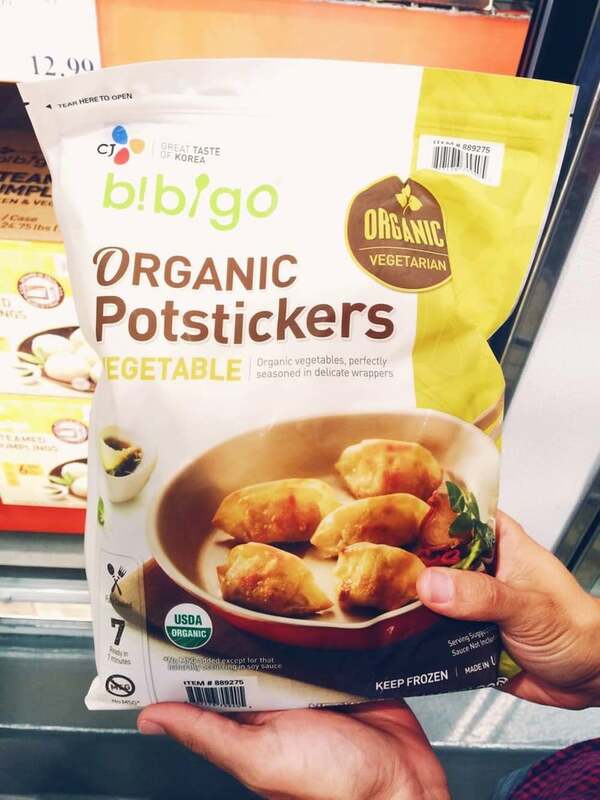 Drew and I tried this potstickers when we first got our membership and couldn’t stop buying them! I love adding them to a dinner, or just having them to throw together appetizer. Clean ingredients and SO yummy! Okay guys, if you are looking for a healthy pizza that actually tastes good – here you go! This is probably one of the better (if not THE best) cauliflower pizza crusts I’ve had. Crispy, thin, topped with flavorful veggies – seriously delicious! One of my top best buys at Costco. 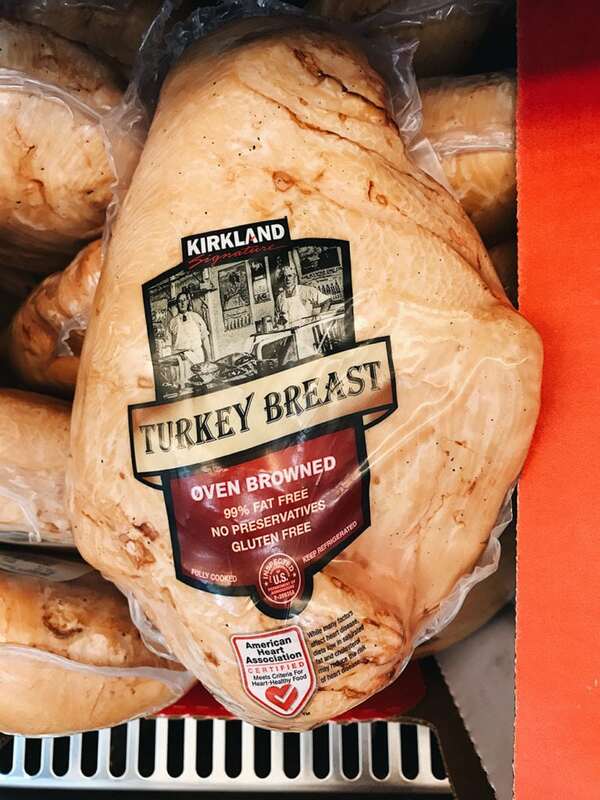 This turkey breast was one of the very first things I ate from Costco. It has nothing added, is a great healthy protein option, and is seriously so yum! This turkey breast is pre-cooked, has delicious flavor, and can be served in so many different ways. Heat it up in the oven with gravy and a side of potatoes, or slice it up for a sandwich or salad. We love it all! 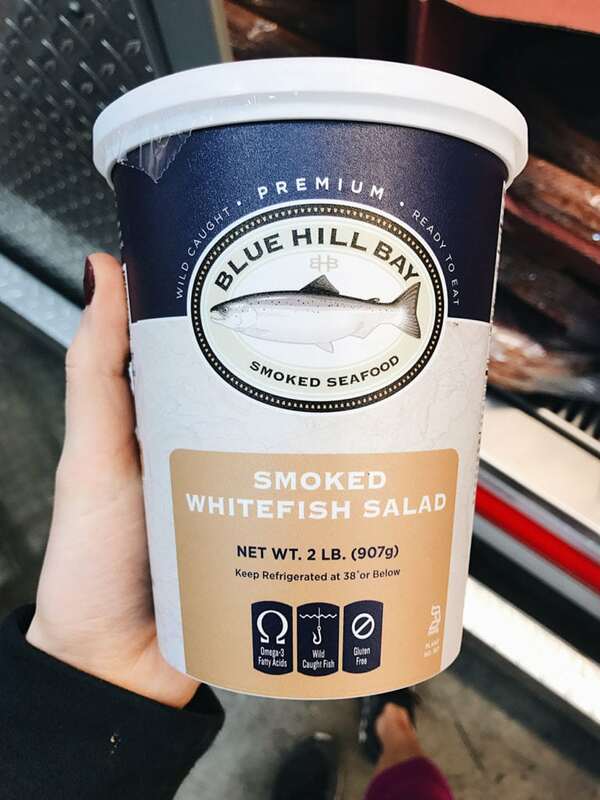 Stay with me here – I will say this is one of the most unexpected things I have loved from Costco! I tried it at a party (extremely skeptical…we’ll put it that way). Anyway, I ended up loving it! A fancy appetizer option to have with crackers for dipping. I mean, what more is there to say? Larabar in peanut butter form is kind of heaven on earth. 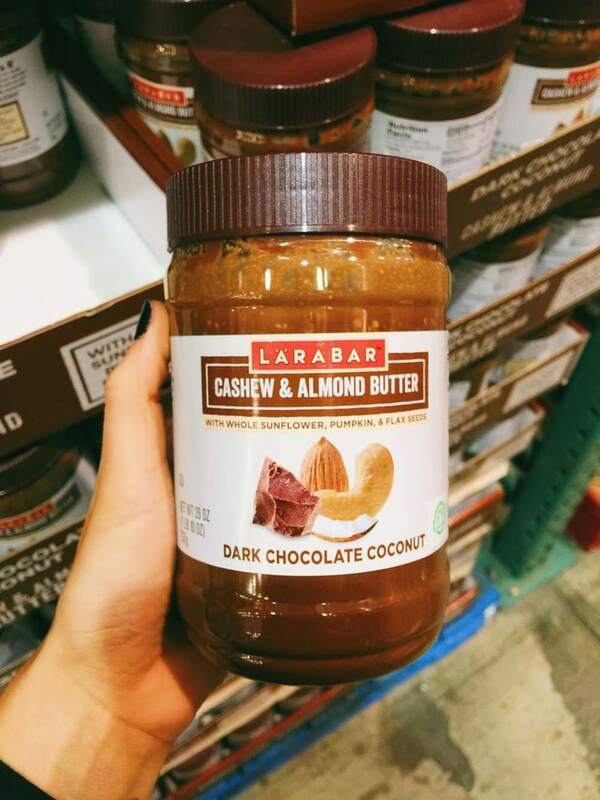 Costco does move their nut butters in shifts, so this may not always be there – but i love the combination of different nuts and added chocolate (obviously). As you can tell from several of my salad recipes — I love, love, love using pomegranate seeds in my salad! 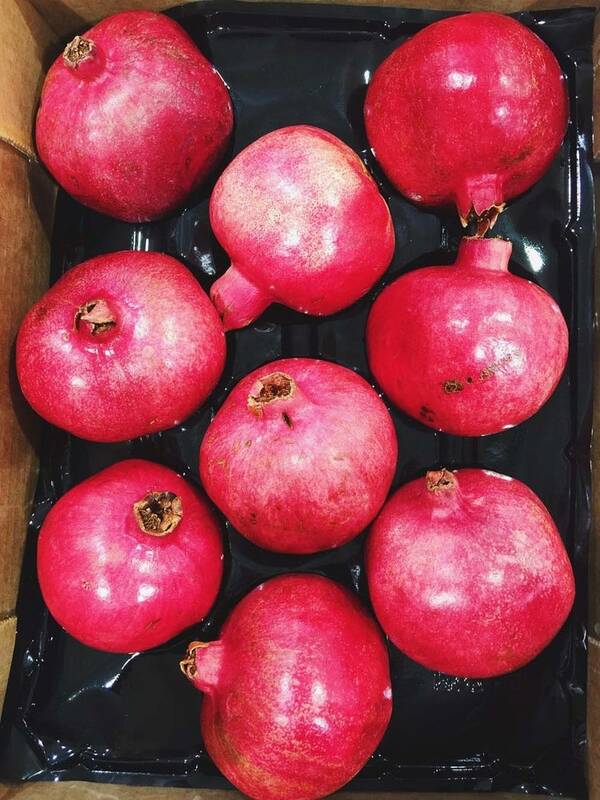 I eat about one (big Costco pomegranate) a day when in season. Ha! Costco not only has the biggest Pomegranates I’ve seen in my life, but you get more for you buck when buying these/any fruit at Costco! So worth it!! 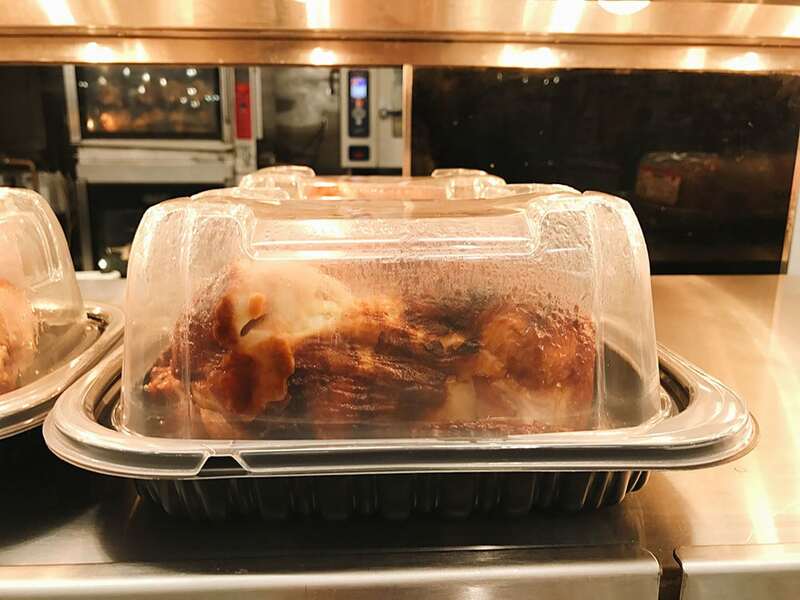 We’ll cut to the chase–I don’t ever leave Costco without my rotisserie chicken! It is one of the most resourceful things I have ever purchased from Costco. Yes, it’s rotisserie chicken–nothing new here–but it’s huge, has incredible flavor, and can be used for multiple dinners from the leftovers. This makes life a whole lot easier. I cannot rave about this bread enough! I was huge into Ezekiel Bread (and still am) before finding this. I love having toast with peanut butter in the morning and this bread is SO great for a GF option. Great texture and taste! LOVE this bread. Also, you are saving about $2 buying it at Costco compared to regular grocery store pricing. Win! 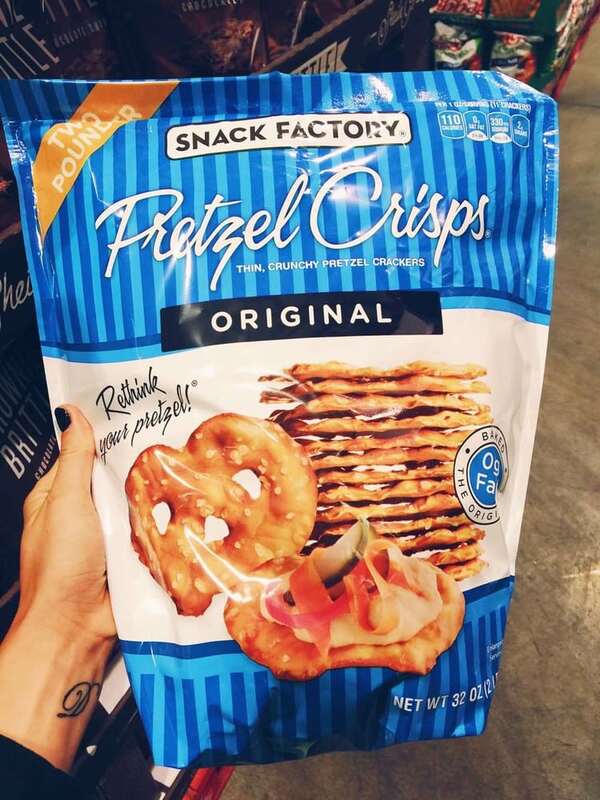 Hollllaaa at all the pretzel luvrzzz! We purchase these almost every Costco trip. We are currently obsessed with dipping them in Costco’s organic hummus!! This pancake mix is ahhh-mazing. I was a little leery when I first purchased it. Due to the ingredients being healthier I wasn’t sure if the texture or flavor would be off. But these are hands down the best “healthier” pancakes I’ve ever had! Since trying them, I’ve told quite a few people to purchase them. If you enjoy making pancakes on the weekend or for a holiday, this is THE perfect addition to your pantry. These pancakes taste identical to a classic recipe, texture is fluffy and soft, with a slightly sweet flavor. And best part is – they are made with all clean, plant-based ingredients. We enjoy these drizzled in peanut butter + honey, and topped with bananas. YUM! We interrupt your current readings to bring you my favorite Costco partner and husband – Drew! Haaiii. Gluten free pizza? Usually does not taste like pizza. But this is seriously yum when it comes to frozen pizza options. Tastes just like regular pizza and is super good! I was amazed when I first had this. We love cooking brown rice in our house, but I’m not the only one in the world to say brown rice takes forever to cook. Not only is this super handy to have because of how fast it cooks but it has amazing ingredients and simple herb flavors to spice it up. 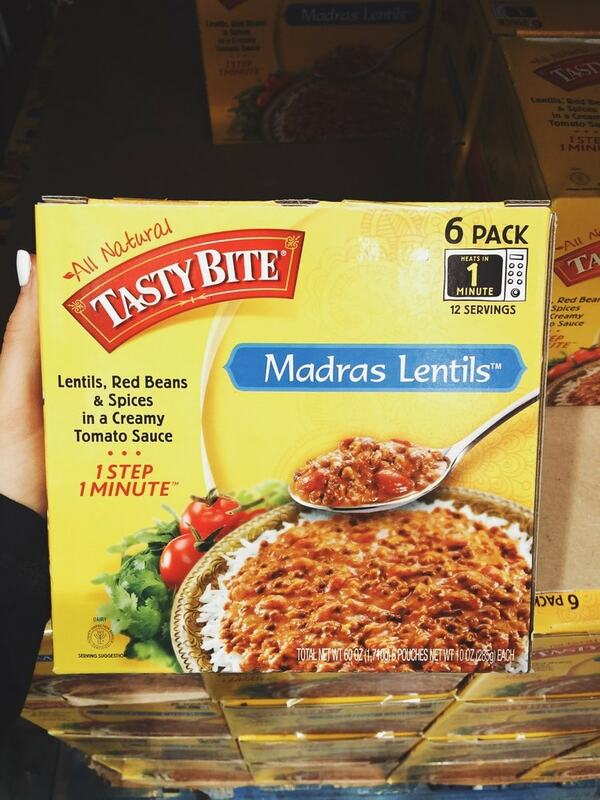 Our favorite way to eat this is as a side dish or with #21 Madras Lentils! If you haven’t yet had these, you must! These are the best tortilla chips ever. Always keep these stocked in our pantry! These are so amazing. And have come to save the day when I have no dinner to make! We put them on salads, buns, quinoa–you name it! They are so delicious. 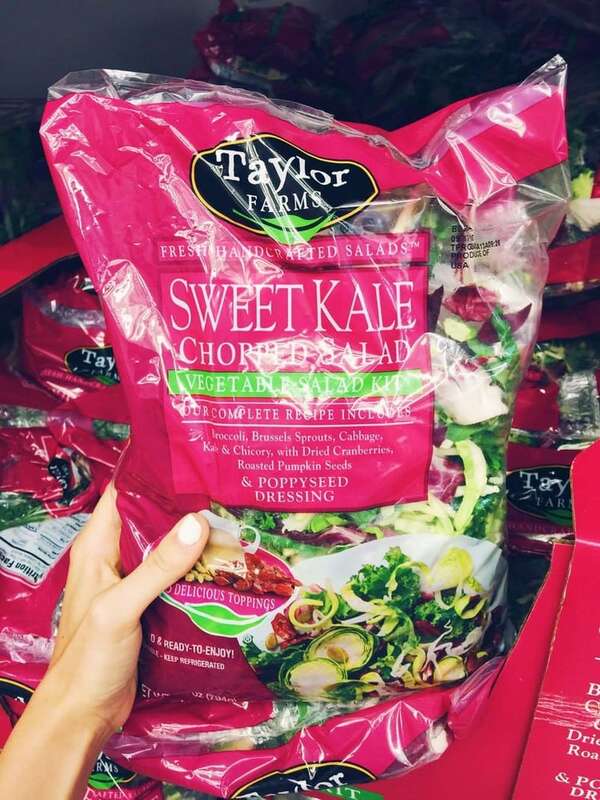 We mention in #2 – Sweet Kale Salad, that we love pairing these two together. Try it!!! 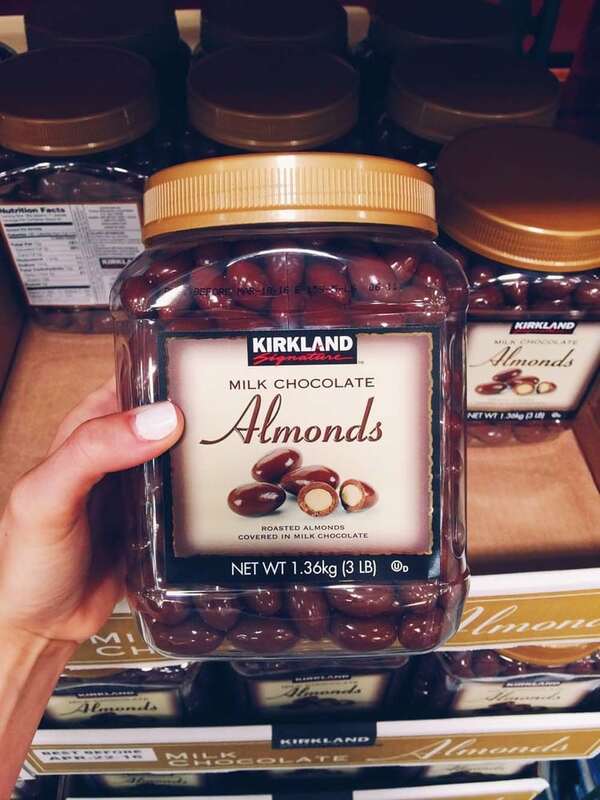 Okay, if you haven’t ever had Kirkland chocolate covered almonds you may need to stop whatever you are doing and immediately go get them. I’m doomed whenever I eat them because I literally can’t stop snacking on those little pieces of gold! 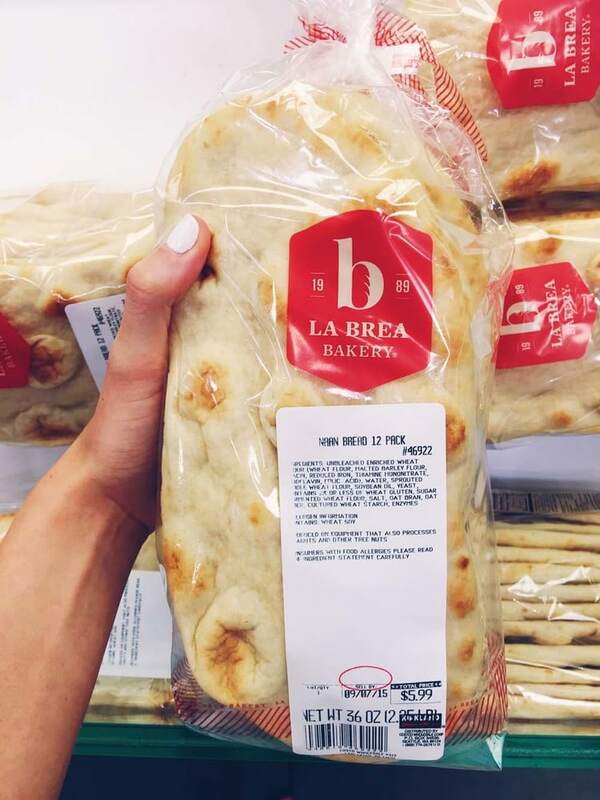 If you love pizza or flatbreads this is such a great item to have in your kitchen! Whenever I buy these for pizza I usually throw the rest of what I didn’t use in the freezer and take em’ out whenever I need them next. You can make the quickest, tastiest pizza’s with these! Naan Bread is one of my favorites. Madras Lentils from TasteBite! And I’m not your average joe that buys quick meals like this. 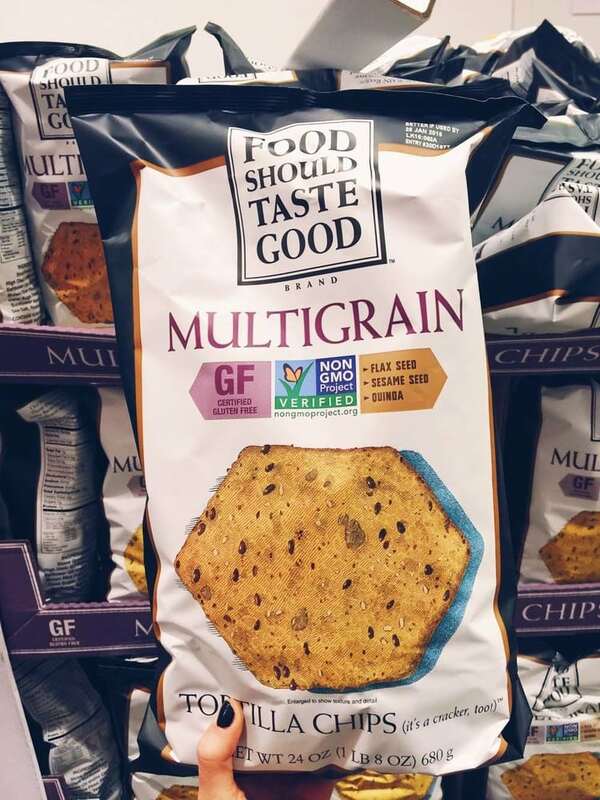 But all the ingredients in this product are clean. HUGE win in itself. And it’s dinner done in 1 minute. Convinced yet? This and #16, Brown Rice & Lentils, are a match made in heaven. They’re literally the perfect back up when I need a quick dinner or side thrown together. So good! Side note: I saw one pack of these being sold at my local grocery store for 1/2 the price of this box (that holds SIX). You are saving a ton on this one! 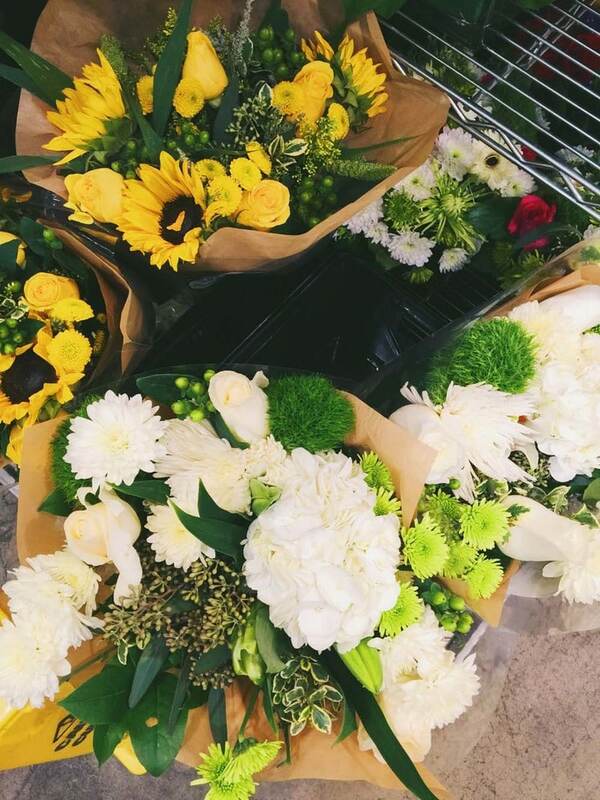 Oh, and Costco is the best place to get flowers!! I hope you enjoyed this post – have you purchased any of these delicious foods I’ve listed? What do you think of them? Be sure to share YOUR favorite best buys at Costco in the comments with me! 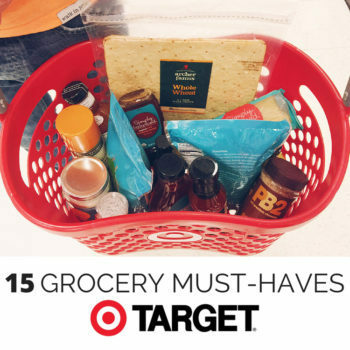 If you enjoyed this one about Costco, or maybe you don’t currently have a membership (sad face), check out 15 Grocery Must-Haves at Target. Would you have egg free and buffalo or goat cheese for food allergies. 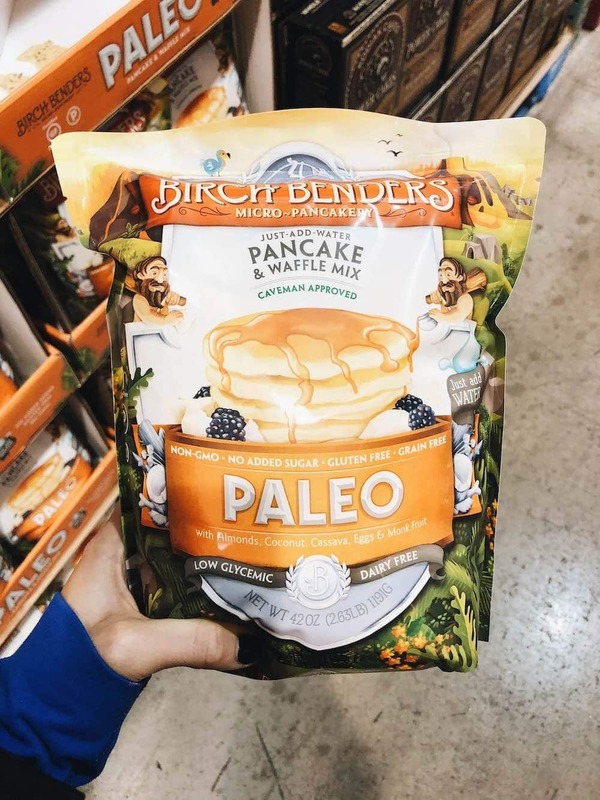 What do you have to add to make the Paleo pancake mix. That always determines if I want to but it. This was the best information I found on Costco items. I was looking for something new for my trip today. I can’t wait to pick up the mangos, rot. chicken and madras lentils. Thanks for your advice! 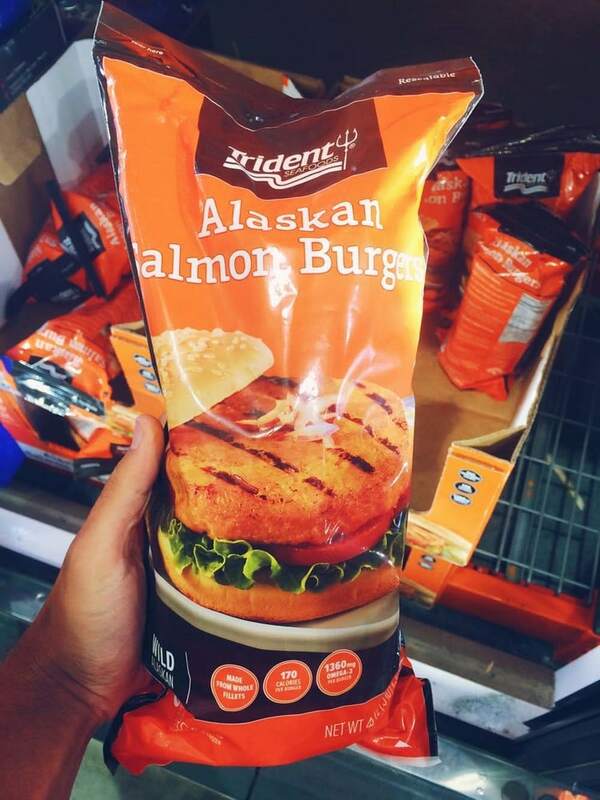 We love pan searing or grilling the salmon burgers. We’ve had it with a yogurt & dill sauce (costco sells Tatziki) or eat with a salad. And amen to that! We always get coffee at Costco – such a good deal! Thank you for supplying this list. Great list! I already buy some of these. Maybe it might help if you mentioned prices? What is the cost of membership for senior citizens? A membership is $50-55 a year – I don’t know the senior citizens cost. Also, try Issio’s breads! Great for sandwiches, toast or melt cheese with vegies on the slices in micro-wave-delicious. This list was great until I saw the cauliflower crust pizza – it was awful! The most cardboard, bland pizza I’ve ever had. A piece of toast tastes better. I tried it twice (package has 2) and the oven settings didn’t make any improvements. That totally surprises me! 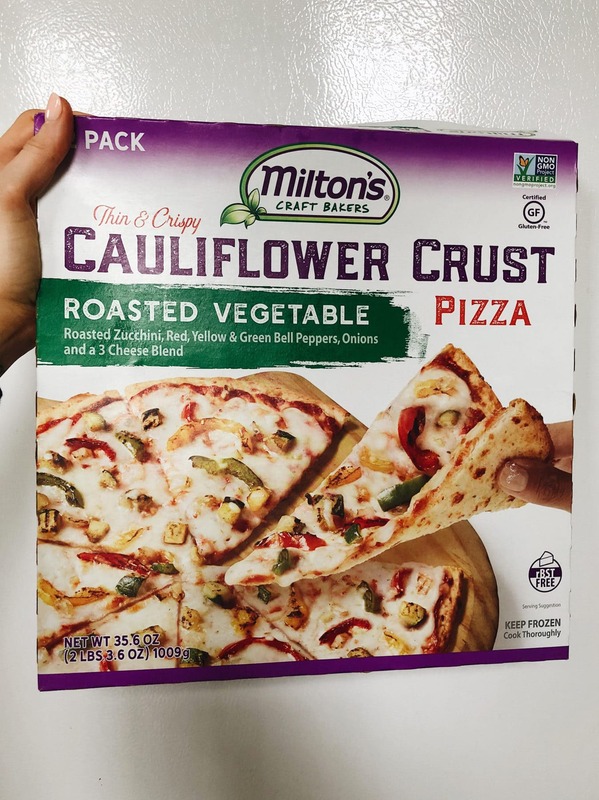 I’ve tasted quite a few cardboard cauliflower pizzas but this one is one of my favorites. Thanks for the list. I will definetly try some of these. 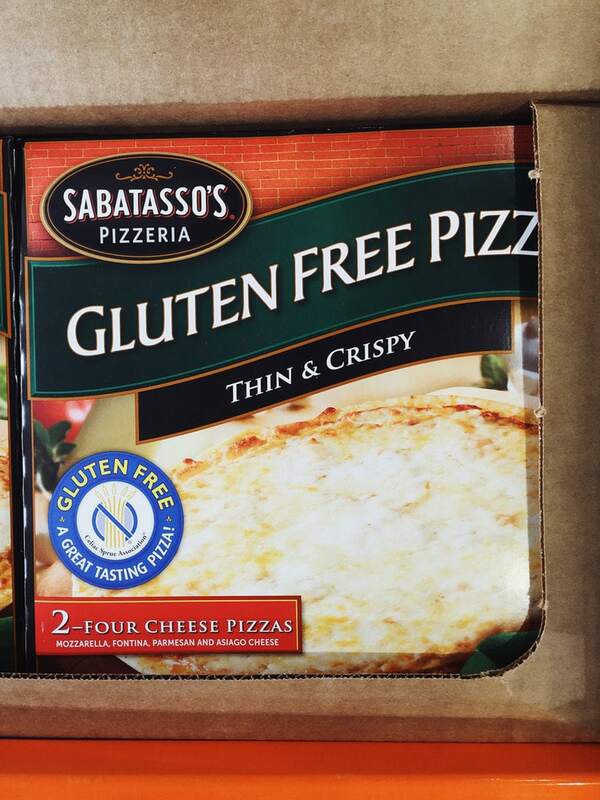 #15 gluten free pizzas i have purchased several times and are very good. Much better than takeout gluten free pizza. Everyone in my house etas them, even if they do not have to eat gluten free. If you have a dog the Kirkland Lamb and rice formula is one of the best rated, most nutritious dog foods around. Our weimaraner has stayed healthy and happy on it for almost a decade now.